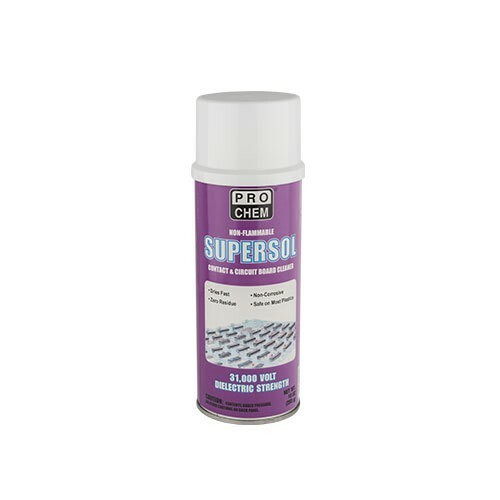 Supersol | Pro Chem, Inc.
SUPERSOL is a high purity, high dielectric, rapidly evaporating aerosol electronic contact cleaner and degreaser. It cleans oil, grease, dirt, dust, condensation and moisture from circuit boards, precision instruments, oxygen equipment, controls, switches, motors and film. It is also excellent for cleaning and degreasing metal parts and fittings. This solvent system has been tested safe on: Neoprene, Buna, Silicone, Styrene, Polystyrene, Butyl and natural rubber, Nylon, Epoxy, PTFE, Polyethylene, Polypropylene, ABS, PVC, Polyurethane, and Hypalon®. For other plastics, test on an inconspicuous spot first. Spray directly onto surface, holding can close to work. For hard-to-reach areas, insert extension tube into actuator orifice. Allow components to dry completely before applying current. Not recommended for use on acrylic or stressed polycarbonate materials. Pretesting is strongly suggested.